Looks like you got a good Nuts guard to protect those wheels, even thou those two robots are different weight class. Honestly, don't machine all the way though, like proper iso-grid and you'll save the pain of the Ti. Or even use duct tape instead of the Ti if it's purely for stopping debris. The armor should be able to flex around enough to stop most spinners. I see many designs where people have a flat plate mounted with lots of shock mounts. The folks on battlebots do it a lot and the plate always gets caught from the side and torn forwards ripping the rubber. They are really awful in tension, if you keep them in compression they are pretty good at shear loads. Which is why beta works so well. If I had more time I would have made it angled, but that takes ages to work out all the angles. Yeah I realized that not going all the way was probably a better plan, since I had put screw holes for the ti behind the wheels lol. 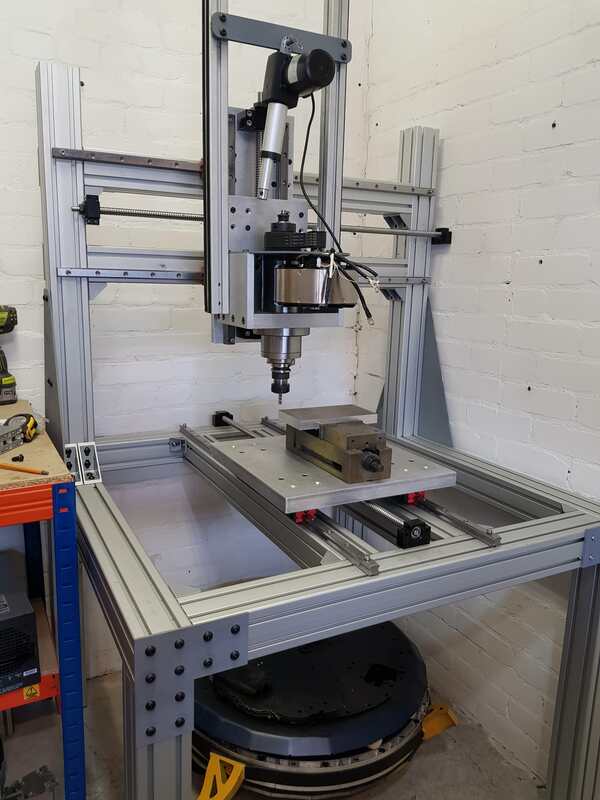 Also saves me needing a spoil board below the part when machining it. Last edited by TechAUmNu; 10th August 2018 at 11:32. Lots of work this weekend on the new drums got the first one mostly bored out, bearing pocket is done and the first hardox tooth fits on nicely. Now I need to flip it round and do the other side... and I broke my dial indicator! Also made up the wheel pulleys, now just the motor one and tensioner to do. Everything else has arrived. Still no quotes on titanium so looks like I need to either buy a piece from ebay and send it to kcut or use hdpe for the top. Last edited by TechAUmNu; 13th August 2018 at 14:31. Finally finished the drum core and shrink fitted the bearings. Just need to glue in the motor can and drill the holes for the shoulder bolts. Also got in some nice shiny BT30 holders for the mill. Lots more work! Finished the main bits of the drum weighs in at about 3.5kg so far. Still needs the shoulder bolts and magnet can for the hub motor. We cast on of the tyres to see what the rubber is like, it doesn't really stay on the wheel... So might need to glue them or something. 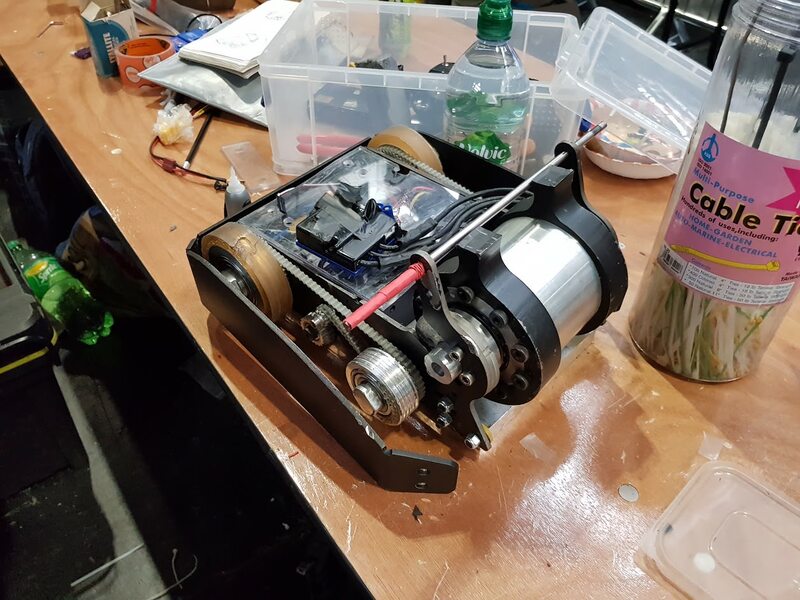 Now back from Insomnia, unfortunately the harder rubber for our wheels didn't arrive in time and the 50 shore we had was just way too soft, we found a bunch of issues and fixed pretty much all of them at the event. In our first fight when we tried to turn the rubber came off our front wheel and jammed the belt on the left side. The right side drive pulley on the motor came loose so we had no drive. Second fight we took the rubber off the front wheels to have 2 wheel drive and added grub screws to the pulleys. Everything was working great. We took out Telekinesis's wheel which knocked him around. He hit our armour and broke the bolt holding it at the front. Unfortunately the bolt was also holding our spacers in place at the front to keep the drum off the floor so we got high centred. Third fight (Whiteboard 8 way) we got rammed at the start and lost traction for some reason, miraculously the hammer missed our drive belts and vesc sitting on top of the bot. We got shunted about a bit and X-303 hit us a few times, eventually righting us. We got traction again. I was unsure if we were doing count outs as it was a whiteboard and moved around a bit (accidentally hitting the claw and the wall lol) before being told to stop moving as I had been counted out. We actually took no serious damage and its still working fine. So we are going to keep the drum and redesign the chassis to make it actually move! Third fight (Whiteboard 8 way) we got rammed at the start and lost traction for some reason, miraculously the hammer missed our drive belts and vesc sitting on top of the bot. Which VESC are you usin? We use FOCBOX for Elevate. Which are basically a vesc 4 in the same general design as the vesc 6 but much cheaper (pretty sure vedder copied the focbox power stage layout for the vesc 6). You can update the firmware to the same as vesc 6.